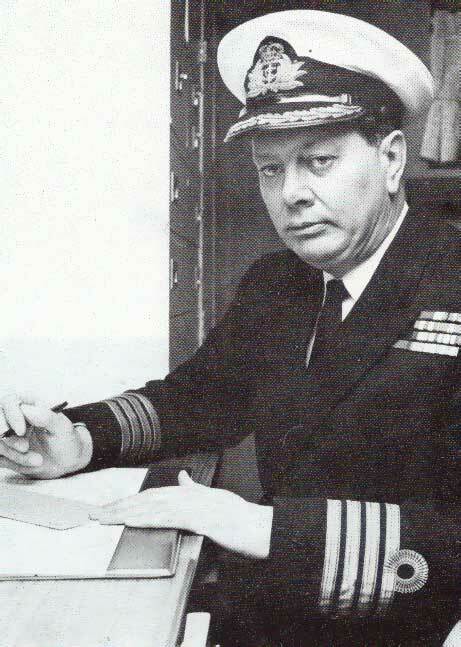 Perth sailed on her last deployment to Vietnam under the command of Captain I. M. Burnside (Pictured Below) on September 14, 1970. HMAS Hobart was relieved at Subic Bay on the 28th. 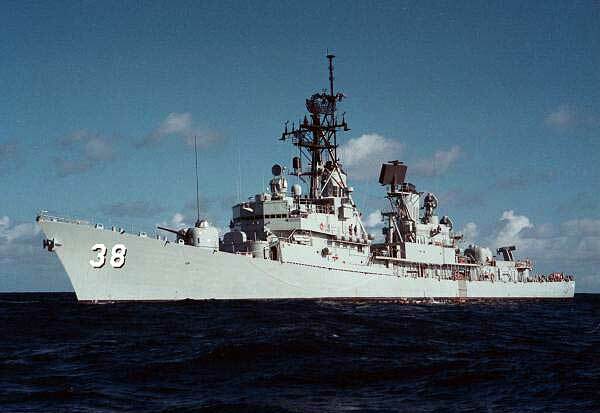 By October, Perth had taken up her NGFS station off Da Nang in support of the US 1st Marine Division. Her first salvoes were fired at Viet Cong infiltration routes in the hills surrounding Da Nang early on the morning of the 4th. The same day Perth proceeded north to the DMZ, remaining there, until the 24th. Bunkers and supply dumps were the main targets of her gunfire with occasional attacks on enemy personnel sighted in the open. In this support of the 1st ARVN Division, the routine of NGFS was often interrupted to allow air strikes to take place. On the 8th, Perth was firing the usual early morning H & I when three fast-moving radar contacts were observed travelling south from above the DMZ. Perth fired on the position of two of the three contacts just as they reached the beach. It was found the following day that the contacts were sampans and that Perth's gunfire had destroyed one, while the other was beached and overturned. Also on the 8th, an active 175 mm rocket site was bombarded resulting in two rockets being destroyed and three enemy killed. Attacks on enemy positions in the DMZ continued with Perth giving special attention to bunker complexes and groups of Viet Cong caught in the open. On October 23, Perth assisted a US Navy SEAL team which landed at night in the southern DMZ to ambush enemy sappers transporting mines brought by WBLCs from North Vietnam. While Perth carried out routine H & I, she remained ready to inform the patrol craft carrying the SEAL team of any WBLCs detected moving down the coast. Perth left for Subic Bay on the 24th to carry out re-gunning and maintenance. After gunnery trials, Perth returned to Da Nang harbour on November 4, and following briefing from the local naval gunfire liaison officer, sailed north to take up station again near the DMZ until the 16th. Perth's bombardment of bunkers and suspected troop positions went on through the period interrupted by the low cloud and rain of the north east monsoon. On the 7th, Rear Admiral D. C. Wells, Deputy Chief of Naval Staff, joined Perth for an overnight visit. After firing on bunkers on the 15th, Perth went some distance south east to assist a VNN coastal group motorised junk reported short of fuel in heavy seas near the coast. Perth escorted the vessel back to its base at the mouth of the Cua Viet. On the 16th, Perth detached from Military-Region 1 and sailed south to Military Region 3, anchoring in Vung Tau harbour on the 18th to fire on a Viet Cong base camp in the Long Hai hills. Caves and bunkers in the hills were attacked with good effect, before Perth left the same day for a maintenance period in Singapore. Returning to Vietnam on December 2, Perth took up station off the west coast of An Xuyen, Military Region 4. Her primary task was to bombard Viet Cong positions in the U Minh. The next day, in a combined operation with land troops and helicopter gunships, Perth’s bombardment caused a large secondary explosion, and petroleum caches were set ablaze. Viet Cong engineering operations and a base camp were bombarded on the 5th before Perth moved south near Hon Da Bac island to fire on troop positions and canal targets for the 33rd ARVN Regiment. Fifty rounds were fired on a Viet Cong mobile radio unit in the U Minh on the 8th and two Viet Cong were killed by Perth’s fire in the same area on the 11th. One Viet Cong was killed and a loaded WBLC severely damaged in the evening of the 13th. During this spell in Military Region 4, Perth often acted as a communication link for the various army units ashore. On the 21st, Perth returned to Vung Tau, firing on Viet Cong bunkers and caves in the Long Hai hills the same day. After H & I firings from Vung Tau harbour on the 22nd, Perth left for Hong Kong where she was visited by the Minister for the Navy, Mr D. J. Killen MHR. Following a seven-day attachment to the destroyer screen of the carrier USS Hancock (CVA 19) on Yankee Station, Perth returned to the gunline on January 17, 1971 anchoring off the southern coast of An Xuyen near Tan An to fire on a Viet Cong ambush site. With this completed, Perth sailed to the west coast of Kien Giang taking up station near Hon Rai island. Air-spotted and H & I firings on suspected Viet Cong positions were carried out in this general area until February 2 in support of the 21st ARVN Division. While Perth was patrolling off the U Minh on February 1, a fishing boat (Pictured Left) was seen to be trying to attract her attention. As the craft approached Perth, it was observed that it held more than the normal crew, and it was thought that possibly some of this number wished to surrender. Perth stayed clear of the fishing vessel until a boarding party was ready and then sounded her siren as she approached the vessel. Seven pairs of arms were raised in surrender. Each man was stripped and searched as he was brought onboard Perth. 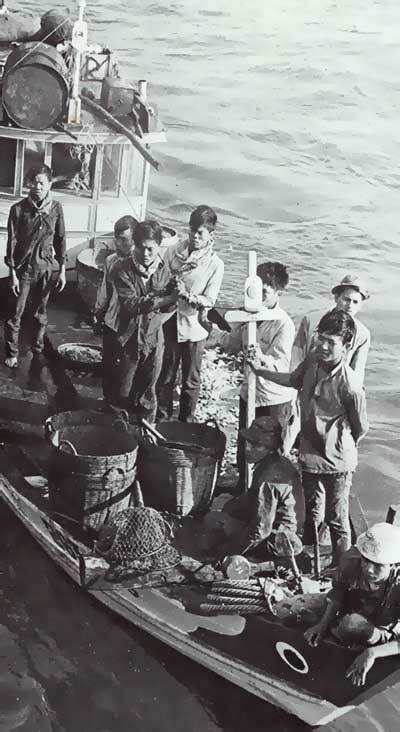 It was found that the fishing boat had been hailed from the shore the previous night by a group of Hoi Chanh (Viet Cong defecting to the South Vietnamese Government) who wished to be taken to a suitable place to surrender. The four-man crew was obviously pleased to hand over its seven ‘guests’ to Perth. Without a Vietnamese interpreter on board, interrogation could not proceed very far until a VNN officer joined to assist. The Hoi Chanh were transferred to a VNN patrol boat which took them to the Market Time coastal zone headquarters at An Thoi, Phu Quoc island. Perth arrived in Bangkok on February 3 for four days rest and recreation, and then spent six days at Subic Bay on routine maintenance. Perth returned to Vietnam on the 22nd, taking up station off southern Military Region 2, where she bombarded hillside landing sites in preparation for a helicopter assault by Korean troops. The same day Perth proceeded to Military Region 3 to support the 1st Australian Task Force. Enemy assembly areas near the Task Force base at Nui Dat were attacked with buildings, wells, boats and bridges being destroyed along the coast of Phuoc Tuy. Vice Admiral R. I. Peek CB, OBE, DSC, Chief of Naval Staff, stayed overnight onboard Perth on February 25. After a short patrol off the coast of southern Military Region 2, Perth joined the carrier USS Ranger (CVA 61) on March 7 as command ship of its destroyer screen while air strikes against North Vietnamese troops in Laos were in progress. On the 10th, Perth took up similar duties further to the north with USS Kitty Hawk. After a rest and recreation visit to Hong Kong and Kaohsiung, Taiwan, Perth arrived at Subic Bay on March 24 to be relieved by HMAS Brisbane. Perth left Subic Bay on March 30 arriving in Sydney on April 8. She fired 9712 rounds and steamed 39,857 miles in her last deployment.